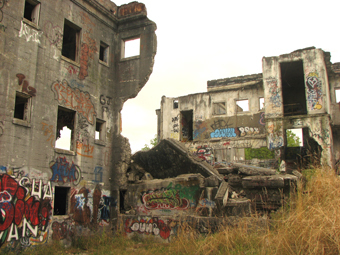 It was pretty easy getting in; the ruins are located in Fort Steilacoom County Park, in Lakewood. I waited until dark to go in, after leaving my car outside of the park, which closes at night. At the end of the Park’s parking lot, there is a path, which wound through heavy woods - lucky I brought a flashlight. It was like walking through a wall of trees, and as I came out of the woods I saw the ruins of the hospital on a hill. It was surrounded by a chain link fence and razor wire, but someone had cut the fence, and I got inside. The building looked like someone had tried burning it down, or maybe blowing it up. I walked inside, and each step echoed through the empty concrete shell, which was all that was left of the sanitarium. Someone told me that there were operating rooms, where they performed lobotomies, and electroshock therapy. One guy said that they even left behind an operating table, with leather straps to hold down the patient. It was creepy. There was graffiti spray painted on the walls, most of which was profanity, but some of it had real weird designs. I heard that devil worshipers hung out there, and the designs looked it. Luckily for me they weren’t around that night. I walked around, looking for a way into the basement and boiler room, which was haunted. When I came out of the woods, I heard the sound of frogs and crickets, and such, now suddenly, the night noises stopped, and it was absolutely quiet. Although odd things happened to Tom and others at this particular ruined building, the horrible things like lobotomies never happened… there. They happened nearby. 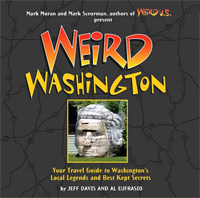 In 1870, the Territory of Washington bought the U.S. Army post of Fort Steilacoom from the federal government and converted the buildings into the Insane Asylum for Washington Territory. The first patients included 15 men and 8 women, who had been looked after by two local contractors who cared for the patients for $1 a day, in some kind of mentally ill daycare. The facility asylum grew, as new buildings were constructed, and a dairy farm provided food for the patients, and the excess was sold to support the facility. Over time, the asylum was renamed, eventually becoming simply Western State Hospital, which came to cover over 860 acres between Tacoma and Steilacoom. Early hospital supervisors were idolized for their ideas of care for the mentally ill, and the hospital itself was considered one of the best in the country, but that changed. 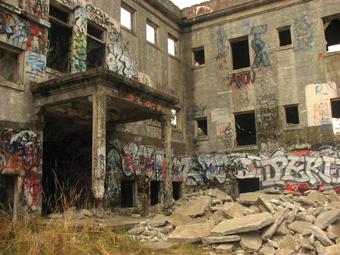 By the 1940s, many of the hospital buildings had deteriorated in the Pacific Northwest rains. Over 2,700 patients crowded into crumbling buildings designed to house 2,200. They were cared for by 14 doctors, assisted by 38 graduate and student nurses. By national standards, there should have been 6 more doctors and a total of 107 nurses. Stories grew of patients being raped by orderlies, who also ran certain wards as brothels for soldiers from nearby Fort Lewis. Some said these were rumors. What were not rumors were the misguided medical treatments performed on many patients. Western State Hospital in Steilacoom apparently became a pioneer in this procedure, to augment the popular electro-shock therapy. One of the more famous patients at Western State Hospital was actress Francis Farmer. She was born in Seattle, where she acted in school plays, before making her way to New York City, and acting on Broadway. She went to Hollywood, where she was hailed as the next Greta Garbo. Farmer became addicted to alcohol and amphetamines, and in 1942, following a series of violent events, spent the next eight years in and out of various mental health facilities. In her biography, Francis Farmer wrote about the traumatic time she spent there, detailing electroshock and insulin shock therapy, and other abuses. She denied having a frontal lobotomy though, and that she could talk about the events years later suggests she was telling the truth. While this did happen at Western State Hospital, the medical procedures were not done in the ruined building in Fort Steilacoom Park. The operations were performed in buildings still used by the hospital. The building inside the park was the Hill Ward, and part of the least shady therapy at Western State. Many hospital administrators suggested occupational therapy for the healthiest and least violent inmates. In 1932, they built the Hill Ward as a dormitory for the patients who worked on the dairy until it was abandoned in 1965. After sitting vacant for several years, Hill Ward was used as a search and rescue training facility for exercises like fire drills, which is when it nearly burned down. To keep people from hurting themselves inside, park officials put a chain link fence around it, which has not worked. In addition to ghost hunters, gangs hang out there, and in 2004, they assaulted and robbed at least 23 people, making any ghosts seem like a small threat. There is still talk about demolishing the building as a nuisance.